Discover southwestern Alberta on the silver screen! Since the early twentieth century, filmmakers have been drawn to the region’s magnificent snow-capped mountains, expansive fields of wheat and historic main streets. 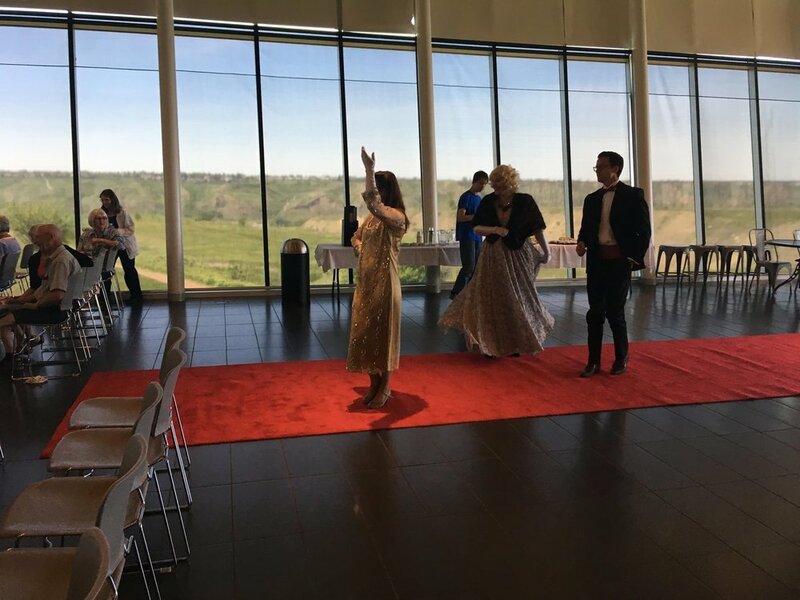 Southwestern Alberta has served as a “stunt double” for many other places, but has also occasionally been the feature of big-screen productions. 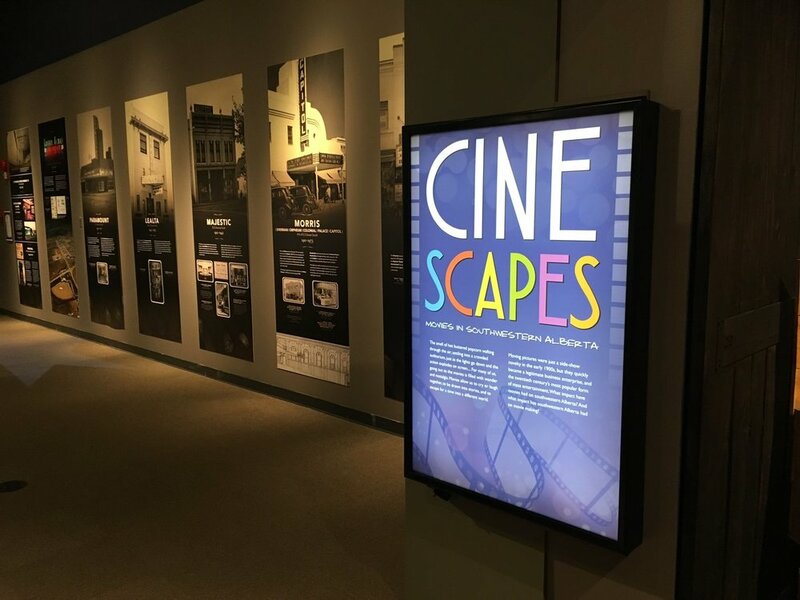 Cinescapes invites visitors to explore the history of movie entertainment, from production to exhibition, as movies evolved from a side-show novelty into one of the most popular forms of mass entertainment. The exhibit showcases artifacts from the local commercial and independent film industry, examples of cinema technologies, a feature on Lethbridge’s “picture palaces” through the twentieth century, and hands-on activities that engage visitors of all ages in some of the mysteries of movie-making. Touring vaudeville shows gave local audiences their first thrill of moving pictures, when short films were added to variety programs; However, feature films were soon the leading attraction. In 1906, the Bijou became the first regular movie theatre in Lethbridge and by 1920 movies had gone from sideshow novelty to mass entertainment. This section invites visitors on a nostalgic stroll through the golden age of picture palaces in Lethbridge, right up to the more recent multiplexes. Movie-making is a collaborative venture that draws on the expertise of performers, technicians and artisans—from scriptwriters and directors, to camera operators and special effects artists. Performers and filmmakers from southwestern Alberta have gone on to fame and fortune, while also cultivating strong independent and amateur traditions at home. This section explores a few of the many individuals making an impact in the film industry today. Discover southwestern Alberta on the silver screen! Since the early twentieth century, filmmakers have been drawn to the region’s magnificent snow-capped mountains, expansive fields of wheat, and historic main streets. Southwestern Alberta has been called the world’s “stunt double”—standing in for locations around the world, and occasionally playing itself on the silver screen. This section explores filming locations, and highlights objects used in the filming of movies made right here at home. As moving pictures matured into mainstream entertainment, they became big business. Local theatre managers used billboards and newspapers to advertise upcoming shows, even offering personal endorsements to assure audiences that they offered wholesome and cultured entertainment. This section showcases advertisements, press books and posters used by local theatre managers. The digital revolution has flooded the market with new entertainment options, yet movies continually innovate to keep people coming back. This final section invites visitors to share their personal memories of movie-going, and to reflect on the future of movie entertainment.